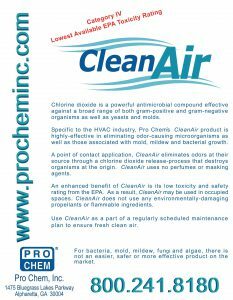 CLEAN AIR | Pro Chem, Inc.
CLEAN AIR’s chlorine dioxide formula is a powerful compound effective against a broad range of gram-positive and gram-negative organisms as well as yeasts and molds. Specific to HVAC systems, Pro Chem’s CLEAN AIR is highly effective in eliminating odor causing microorganisms as well as those associated with mold, mildew and bacterial growth. As a point-of-contact application, CLEAN AIR eliminates odors at their source through a chlorine dioxide release-process that destroys organisms at their origin. An enhanced benefit of CLEAN AIR is its low toxicity and safety rating from the EPA. As a result, CLEAN AIR does not use any environmentally damaging propellants or flammable ingredients. Use CLEAN AIR as a part of a regular schedule maintenance plan to ensure fresh clean air. 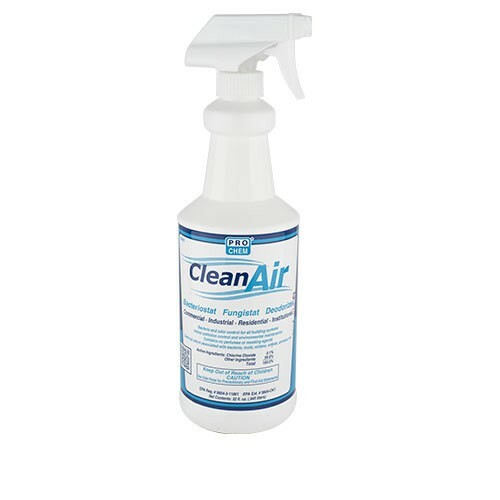 Destroys odors associated with bacteria, mold, mildew, smoke, animals, etc. Apply with a handheld fogger or an air-driven sprayer. For general odor control, apply a liberal amount of CLEAN AIR undiluted to the origin of the odor. 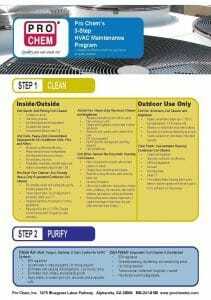 For example, apply CLEAN AIR directly to system duct work, drip pans, evaporator coils and other areas associated with bacteria, mold, mildew, fungi, yeast, and algae. For microbial control, first clean and sanitize the system, then apply a liberal and undiluted amount of CLEAN AIR into the system intake while the system fan is running to ensure complete microbial environmental control. One gallon of CLEAN AIR will treat approximately 1000-1500 square feet.